It’s rich, it’s strong, and it comes in a tiny cup – that’s right, it’s espresso! And now, you can make a pitch-perfect one every time with our best coffee beans, grounds and pods for espresso lovers at home. Let’s face it, you’ve got to really like coffee to like espresso, and when getting it right is paramount, finding the best coffee for espresso lovers can be… well, a challenge. We understand the struggle, so we’ve put together a list of our favourite beans, grounds and pods for making the perfect dark, strong espresso with that all-important crema. The majority of our picks are medium roasted, and with good reason: using a light roast for espresso runs the risk of a watery cup, and very dark roasts, while preferred by many who like their coffee on the strong side, can run the risk of coming out bitter and even oily. Of course, it’s all down to personal preference, but with medium to almost-dark roasts consistently coming out on top with home tasters, we think they’re a good bet if you’re not too comfortable experimenting yet. Whatever your favoured roast, the freshest tasting cup is always going to come from just-ground beans, so we’ve included a good number of whole bean coffees for grinding prior to putting in the pan, should be lucky enough to own a coffee grinder, or for going straight into bean-to-cup machines. Throw in the odd bag of ultra-convenient pre-ground coffee and a standout showing from pod purveyors Nespresso, and you have what we call a well-rounded list with a balanced flavour. It’s a conflict as old as time itself: they like a punchy dark roast, you like a smooth medium, so what’s a coffee-loving couple to do? Well, according to devotees, Kicking Horse’s popular Three Sisters grounds meet perfectly in the middle, not too watery for those who like their coffee with a bit of oomph, and not the all-guns-blazing rocket fuel that might send medium roast-lovers running for the hills. They say you don’t need to use much to get a fantastic flavour, so that rich, bold cup is economical too. As a real crowd-pleasing everyday coffee, it gets our top spot. Having a gold star Great Taste award to your name is always a good sign, but it’s not just critics who rate Spiller & Tait’s signature blend beans. At-home tasters love the strength, smoothness and complete lack of bitter, burnt aftertaste some darker roasts can suffer from, and commended the great crema. They also found that it stood up perfectly to the stovetop espresso maker and cafetiere alike, so if you like to change up your coffee-making methods every now and then, this looks to be a versatile option. We’ve no doubt that many Nespresso users have already pledged their allegiance to particular pods, but for those who aren’t sure where to start – or don’t mind being swayed away from their usual Rosabaya or Dharkan – the Livanto comes highly recommended. These golden pods blend Arabica from Costa Rica and Colombia for what Nespresso call a “malted and fruity profile”, and are firmly in medium espresso territory: complex but well-rounded, with caramelised notes and a touch of fruitiness. What was that we were saying about crowd-pleasing coffees? This one’s a corker too, and reviewers have raved about its gorgeously smooth taste, decently strong but not overpowering kick, and most importantly – well, it is in the name after all – its velvety crema. Users who used it in conjunction with a bean to cup machine were particularly impressed, but with its dark spicy kick, hints of chocolate and caramel, and savoury malty heart, it excels at whatever it puts its hand to. As a medium roast edging towards dark, this Marley-grown coffee – no, really, Bob’s son Rohan Marley is the mastermind behind it all – presents an unusual profile. Tasters found that, made in a moka pot, it came out more like an Americano, encouraging for anyone worried about blowing their socks off with an overly strong cup first thing in the morning, but also remarked on deep, complex notes of wood and leather, with a hint of chocolate in the aftertaste. A great everyday coffee that sits apart from supermarket competitors, and organic, too! There’s that “Super Crema” claim again – this one, from Coffee Masters, follows Lavazza’s example in making a rich and full-bodied espresso with just the right amount of fine, reddish brown foam. This time however, sweetness is more at the forefront, promising notes of creamy milk chocolate and hazelnut balanced out by just the right amount of acidity and bitter cocoa, with that dark heart coming courtesy of the blend of typical Arabica and more hard-edged Robusta beans. 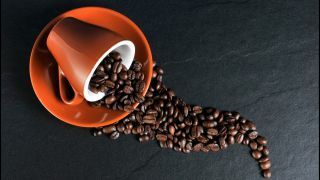 Make full use of that grinder with our list of the best coffee beans for a delicious home brew, whether you love a latte, crave a cappuccino, or have a fondness for a flat white.